Banerjee's allegation came at an election rally in Murshidabad district where her party is in a four-cornered battle with the three. The Trinamool has never won any of the three Lok Sabha seats in Murshidabad -- Baharampur, Murshidabad and Jangipur. She also accused the Rashtriya Swayamsevak Sangh (RSS) of funding the Congress' Baharampur candidate and sitting MP Adhir Ranjan Chowdhury and its Jangipur candidate and former President Pranab Mukherjee's son Abhijit Mukherjee. "BJP, Congress and CPI-M have formed a nexus to defeat Trinamool. They fight together against the Trinamool. They fought together in panchayat. 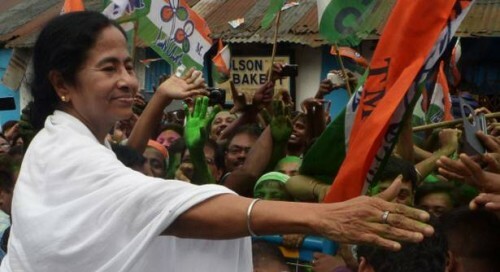 Trinamool is powerful in Bengal," she said. The Trinamool leader said: "Why are they (Congress and Left) trying to weaken our party to strengthen the BJP?" She warned that the Congress "should not feel that they are the only national party" in the opposition grand alliance. "Trinamool is also a recognised as a national party." "Ask Adhir, whether the CBI harasses him or not," she told a rally at Beldanga. Launching a scathing attack on Chowdhury, Banerjee said: "How many days does he stay in Bahrampur? He does politics for the BJP in the morning, Congress in the afternoon and CPI-M in the evening." Banerjee also accused the central forces -- the Border Security Force, Central Reserve Police Force and Central Industrial Security Force -- of threatening rural people to work in favour of the BJP. "I have respect for the central forces -- BSF, CRPF and CISF. I have got some information that you (central forces) are threatening people in some rural areas to work in favour of the BJP. Law and order is a state subject and if you have any issues, (you) discuss with the state," Banerjee said.